Who are the people behind Water Compliance Services? Whatever line of work you are in, people are more likely to hire your service if they feel some kind of connection with you and your values. Relationships are built on a whole range of factors and one of the main ones is trust. Trust that you can do the job. Trust that you are honest, reliable and prepared to go the extra mile. After all, we all need each others’ services, don’t we? That’s one of the reasons I thought it would be good to share a little bit about who I am and how I got into the water compliance industry. So here goes…here’s a little about me! You may be surprised by my own journey and what I get up to outside of work. 1. How long have you worked at Water Compliance Services Ltd? I have been with the company since its incorporation in April 2013. There’s never a dull moment and it has been all hands on deck ever since. 2. How did you get involved in water compliance and water regulations, and what prompted you to set up the company? Great question. Having completed a BTEC National in IT Applications at Huddersfield Technical College, I couldn’t afford to go to University and I couldn’t get a job in computing as I had no experience. However, I managed to land a job as Office Administrator at Rentokil Hygiene in Morley, Leeds. That led to working with the Hygiene Engineers, cleaning drains, washroom hygiene and even “special cleans” such as house cleaning following persons passing away in them. With a young family, I needed the money! After 18 months an opportunity came my way to work as an Air Hygiene Engineer, cleaning out air filters in pubs, for example, back in the days when smoking was allowed. Soon after, Rentokil Water & Ventilation Division amalgamated with Rentokil Hygiene, and I moved into the role of Legionella Service Engineer, which involved such tasks as undertaking monthly service visits, checking temperatures and cleaning showers. I soon moved on to other tasks such as tank cleaning etc. My colleague at Rentokil was a trained Pipe Fitter and we soon made a remedial team where I started to learn basic plumbing such as removal of dead legs through to taking out 30,000 litre cold water tanks. 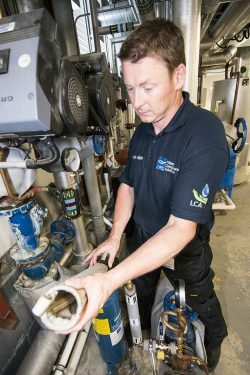 Eager to learn more, I went to Leeds Technical College to attend a plumbing course but it wasn’t for me. What other avenues were out there for me? I went to NGST in Leeds and successfully completed the unvented cylinder training course, so I was now approved to install unvented cylinders. How would I progress without being a qualified NVQ Level 3 plumber? I sat the Yorkshire Water / BPEC approved Advanced Water Regulations course at the Yorkshire Water office in Esholt. This allowed me then to become a WRAS approved plumber. I am proud to be able to say I can more than hold my own with any conventionally trained plumber while being able to teach them about Legionella Control and Water Regulations. Not every plumber goes down the conventional route of college and an apprenticeship. Sheer hard work, determination and lots of experience got me to where I am now. 3. What do you like to do in your own time? There’s nothing better than spending quality time with my family. Other than that, I have trained in Shotokan Karate for a number of years now and I really enjoy riding on my motorbike. I also happen to be the Safety Officer and on the Executive Committee on the local Cub Scout Group. It’s great to be involved in the local community. 4. If you could go for dinner with any person living or dead, who would it be and why? Bruce Lee: how he generated so much power and executed techniques so well, but saying that I would probably prefer to see my mum again. She died early at 56 from motor neuron disease. I miss her everyday even after 7 years. Her kind thoughtful way and the advice she gave is sadly missed by all who knew her. 5. If you could write your own epitaph what would it be? Good old Yorkshire Lad, worked hard and always did his best! If you are also a martial artist or etched a unique and interesting career path to get to where you are now, you can be assured you are not alone. We will be posting similar interviews about the other members of our team so you can get to know the WCS family. In the meantime, if you are looking for a company who can assess your premises for water compliance, make recommendations and implement any remedial work that is required, get in touch today.